T.J. Kirkpatrick/Getty ImagesRep. Fred Upton (R-MI) speaks to the press after a Republican conference meeting on November 13, 2013 in Washington, DC. 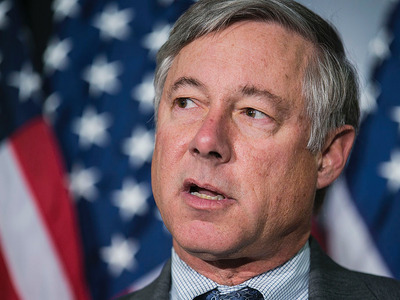 Michigan Rep. Fred Upton said Friday that he will not endorse presumptive Republican presidential nominee Donald Trump. “Not a lot of happy campers in how this race is proceeding thus far,” the Republican congressman said. Upton is part of a growing list of conservatives who have refused to endorse the Manhattan real-estate mogul. Ohio Gov. John Kasich, Sen. Lindsey Graham, and Sen. Jeff Flake have all refused to throw their support behind Trump so far. Upton is the chairman of the House Energy and Commerce Committee.